I'm joining a group of lovely ladies/bloggers in a new linkup designed to encourage vulnerability, transparency and honesty. I came across Rachel from Oh Simple Thoughts on Instagram and really loved her posts and her heart. When she floated the idea of a monthly linkup, designed around a prompt and bible verse, I was sold. So what IS a linkup? It's basically a bunch of bloggers who post about the same topic on the same day, then share those posts in one central location--go to Rachel's post to see the list of everyone contributed. 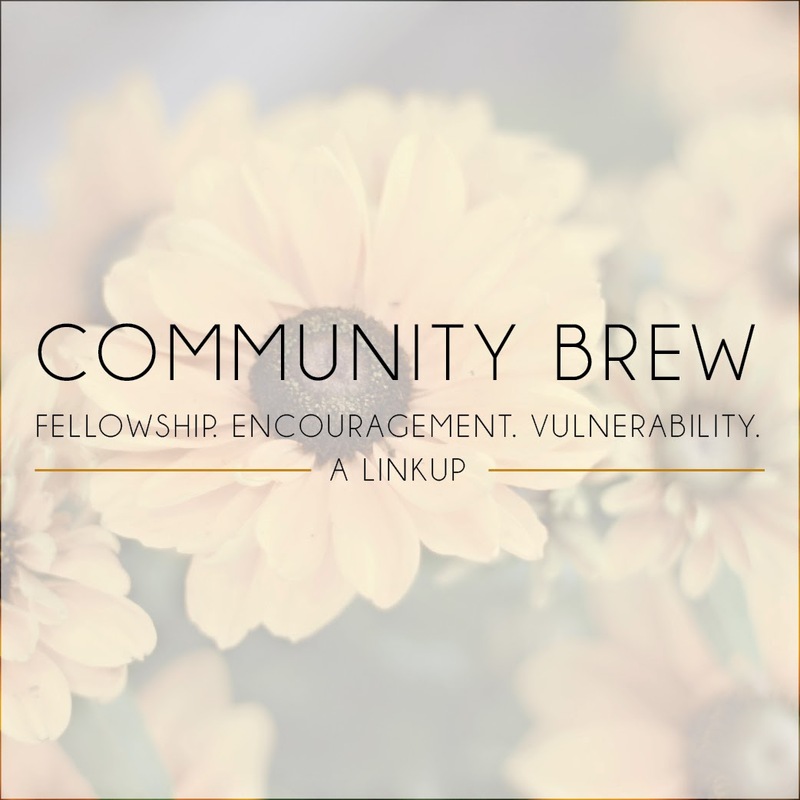 Today's prompt focuses on community. A super timely topic in my life especially, as I've really been dwelling on this idea and what it means. Really, since reading Shauna Niequist's book Bread & Wine: a Love Letter to Life Around the Table, I've been craving community. Dinners. Conversations on the back porch. A rich life filled with a tribe of people to share everything with--victories, failures, successes, struggles and most importantly, our walk with the Lord. It's a process finding your people! Reflecting on this, I realized how much we were truly designed to live in community. And "community" to me means so much more than "friendship." Community means to truly immerse yourselves in the lives of another--to walk with them through the fire, to help shoulder their burdens. In high school, many of my best friends had grown up in an ecumenical christian community known as The People of Praise. There are branches all over the U.S. and I saw firsthand how rich a life living in community could be. These people chose to live close to one another--not in a commune, but a few minutes down the road in different neighborhoods and houses, but close enough to drop in whenever. They gathered for "community dinners" once a week, where 3-5 families rotated hosting one another for a meal. These weren't productions where the house had to be clean and everything perfectly so, but real life. Messy houses. Whiny kids. But gathering all the same. Every Sunday, usually after everyone went to their respective churches, the whole branch would gather for a meeting. Share verses that spoke out to them from Scripture, share their struggles and successes, pray for one another. The kicker? These people committed to this community. You go through a time of discernment about whether the life is right for you and your family, and then you commit. Commit to walking alongside one another. Commit to doing life with each other, always. I discerned this life for awhile myself but ultimately the Lord pulled me in other directions and I have peace that it wasn't meant for me. But it was so cool to witness what true Christian community can look like in today's world. Would all of those people have been friends outside of their commitment to the community? I can almost guarantee they would not have. But they found common ground there, and in the Lord, and a beautiful life was built around that. I crave that so much for myself and my little family. I want to find our tribe. Our community. It's been a fervent prayer for awhile now. Not just a friend group. Not just a church group. Tribe is the best way I can describe it...they're your people. The Lord is definitely beginning to show me bits and pieces of what that might look like and I have so much faith that he's weaving an incredible story for us. I want to do life with people. Messy, wonderful, beautiful, hard, incredible life. I think it's how we were made to be. The internet can be a scary place, filled with sarcasm and negativity and incorrect info at the very least, and total moral depravity at the worst. Sometimes, the internet is too overwhelming. And other times, the internet is a wonderful tool for fostering community, meeting new people and encouraging one an another. Today is one of those times. When Rachel of Oh Simple Thoughts tagged me in a post on Instagram about participating in a blog linkup, I was so excited. Rachel is a breath of fresh air in my feed that sometimes feels dominated by too-perfect breakfast tables and color coordinated kids and spur-of-the-moment road trips to the Rockies. I'll admit it, I'm also guilty of the Instagram Perfection Plague (which I just made up and might trademark, haha!) I've always wondered about people who meet friends on the internet and then turn them into real life friends. And I'm learning more and more that Instagram is an incredible platform for doing just that. So Rachel dreamed up this "coffee date" idea, and I love it. A group of women, bloggers, Christians who are sharing their heart and where they're at today on the blog. You can head here to see the rest of the participants. It was such a joy reading their posts. Rachel asked in her post, "How are you friend? Are you weary? Are you barely stumbling along? Are you filled with joy and rejoicing in the Lord? Are you overwhelmed?" My answer to her would be yes, yes, yes, yes. I am weary. I am barely stumbling along. I am filled with joy and rejoicing in the Lord. I am overwhelmed. I am brokenhearted and so grateful. I am crushed in spirit and yet so invigorated by the approaching Easter season. Yesterday, my friend Jen's husband was shot and killed in Indianapolis while out for his morning run/walk, most likely praying, as was his custom. Jen and Nathan were married less than a year. Jen is 8 months pregnant with their first child, a daughter they have named Cecelia. He was on his usual route, in their neighborhood, when he was targeted, potentially mugged and killed. There is simply no making sense of a tragedy like this. There is no wrapping one's mind around it. It is truly unfathomable. I have experienced death too soon, when a high school classmate passed away of leukemia at just 23 years old, but I have never experienced true evil, such violence, up close and personally. It's another thing altogether. It's world-rocking. And yet, it's incredible the way it draws us closer to faith. I have always been afraid of dying. My mom, a super wise and devout lady, has always said she can't wait for Jesus to come back. Hearing her say that made me want to scream. He can't come back until I get married, have a family, pursue my dreams! He can't come back until I see the world, start a foundation, reach my goals! He can't come back until I've made my life what I think it should be, and have lived to see my children and grandchildren! I was petrified of dying. But more and more, and especially in the last day, I too am yearning for the day that Jesus returns. I am realizing that this world is not where we belong. It is not home. I no longer want to get too comfortable here. I want to live my days, whatever their number, fulfill the plans God has for me, and then go to my REAL home, my eternal home, Heaven. So I'm grateful. I'm filled with joy and rejoicing in a Lord who has prepared such a way for us. I am overwhelmed with sorrow and confusion and anger and heartbreak, but I am so invigorated by the promise of salvation, by the approaching Easter Sunday where we can celebrate Jesus' resurrection and the resurrection of all the faithful departed. He has made you. He will carry you when your legs are too weak to stand on. He will sustain you when you have nothing left. And He will rescue you when you feel like giving up. What a mighty God we serve.